I can’t believe that I’ve lived in Newcastle for so long and have never eaten at The Living Room. Needless to say, I loved it. We decided to go with another couple and take advantage of their Newcastle Restaurant Week offer a few weeks ago. It was a sunny Saturday afternoon, not like today with the awful on-off pouring rain! We got some drinks at the bar, and then headed through to the gorgeous, elegant interior. I loved the heavily-draped purple curtains and the high ceilings and windows. I had no idea it was so huge inside. For starters, I ordered the duck spring rolls with plum sauce and MrJ ordered the soup of the day which was onion soup. 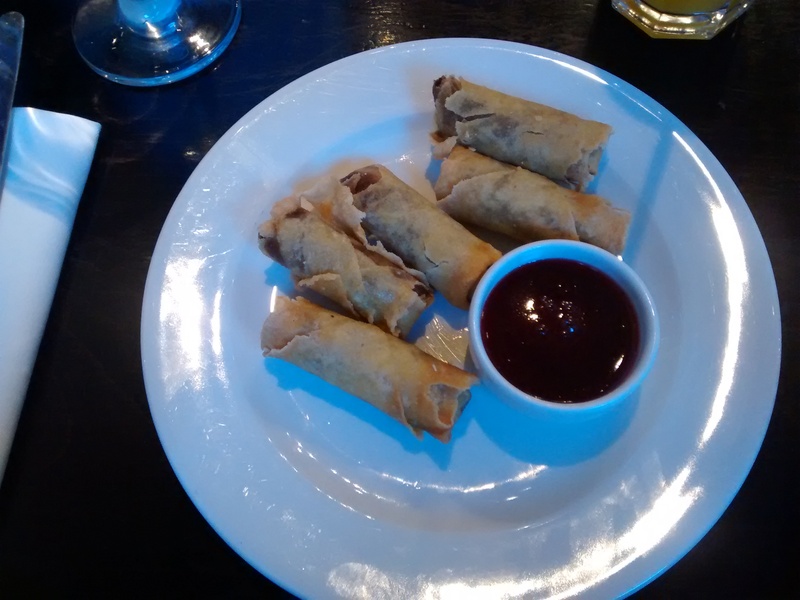 My dish was great, and I was happy with the five, decent-sized spring rolls. The plum sauce was sweet and sticky. 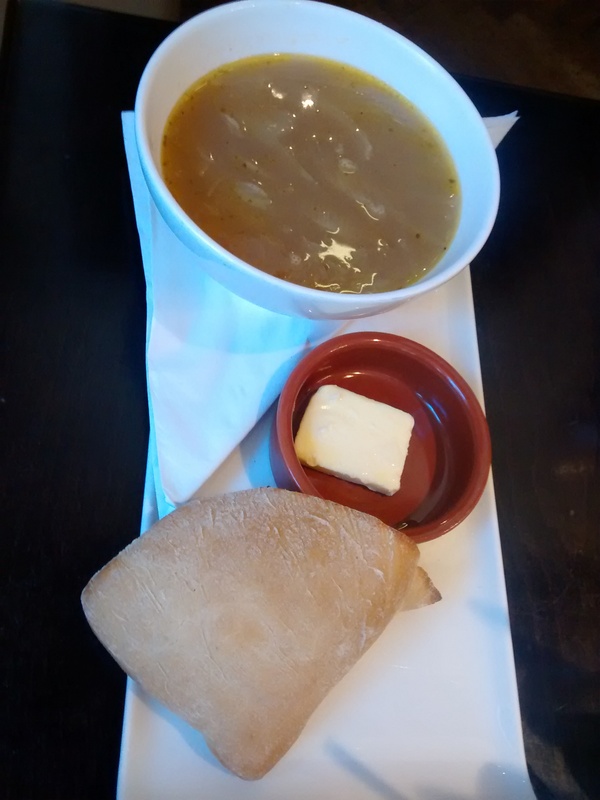 MrJ’s onion soup, oh my, it was heaven in a bowl. I couldn’t get enough of it (he was kind enough to share it with me after he had had enough)! I was even half tempted to go and ask the waitress to bring the chef out and tell me how to make it. I will definitely be going back for that soup alone. It was also served with a nice roll and butter. For the main course, we both opted for the same: a pulled pork sandwich with apple chutney in a brioche bun, served with french fries. It was lovely. The pulled pork was succulent with a good flavour, and wasn’t too wet so the sandwich (more like burger) held together well. 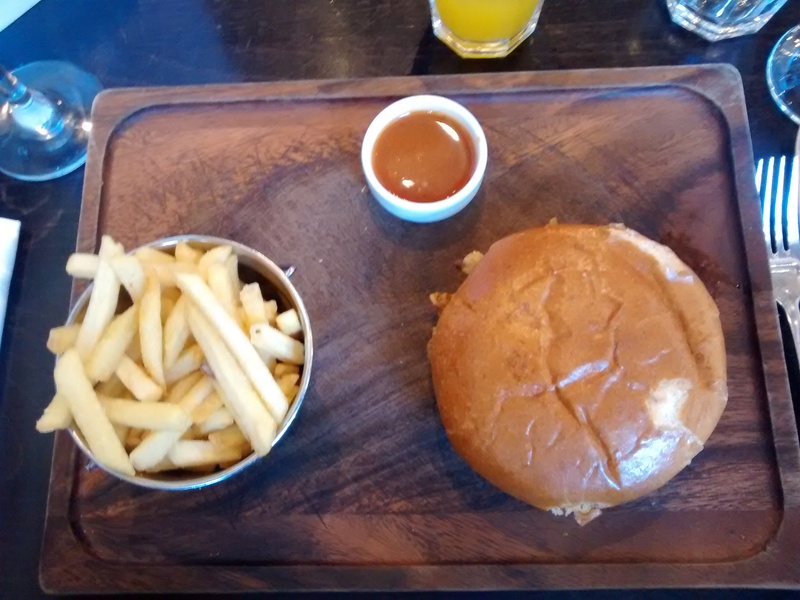 The french fries came in a lovely little silver bucket, and the whole meal was nicely presented on a wooden chopping board. For dessert, MrJ got an eton mess, and I got sticky toffee pudding. I have to admit, the sticky toffee pudding wasn’t that great. It was very chewy in places and also came with a helping of rum and raisin ice cream which wasn’t mentioned on the menu. The rum flavour was pungent and over-powered the dessert. If I knew it came with the rum ice cream, I would have opted for something different. However, I feel that this was more a one-off dislike, as everything else was so scrummy and I’m sure if I went back again the desserts would be just as fab. So, you might think “this is all great and everything, but Restaurant Week is over so I can’t get the same deal!” Well, you’ll be happy to know that everything on the Restaurant Week menu is available on their regular dining menu, and they have a delightful Supper Club offer of 2 courses for £11.95 or 3 courses for £14.95, so you can still eat here for a bargain price! We went to the Living Room during the Winter Restaurant Week and really loved it. Unfortunately our “to do” list is so long we haven’t had a chance to go back since but we definitely will at some point, the food is lovely. Re interior restaurant shots, I always try and book a table at “off peak” times so that there aren’t too many others sitting at tables around us otherwise it can be quite difficult to run about with your camera taking photos. I always feel very wary of disturbing other diners by looning about with my camera!